The Salisbury is a very plain and simple and suits a wide variety of interiors. The Salisbury is available in 5 models - The Salisbury 4, Salisbury 5, Salisbury 5 log store, Salisbury 6 and Salisbury 8. Stove expert replied: Expansion noise is not common but nevertheless annoying. Are you certain that it is the stove that is the cause and not the flue system? Have you made the supplier aware? Ratings reflect this issue. Stove expert replied: A good solid stove that is well rated. Stove expert replied: Have you an airbrick or room ventilator fitted? Does the flue draw match the requirements of the manufacturer? Is there another chimney in the property? This is likely to be a installation / flue problem so would recommend further investigation. Make sure that you have a carbon monoxide alarm fitted. There is usually a reason why the flue gases are not lifting away from the firebox, not enough air in the room, not enough draw in the flue. Another chimney in the property is stronger that the one being used which is giving a negative pressure preventing the gases from rising quickly when the door is open. If nothing is found to be at fault, a flue fan may be the best way forward, there are several options on the market. Stove expert replied: Do check that the wood being burnt has a moisture content of less than 20% and keep the air controls open so that the glass can stay clean. Perhaps the damper arm / hole location gets too tight when hot and a slight modification could improve this operation, further investigation is recommended. All stoves will require ash removal - you do not say what the actual problem is with this on the Salisbury stove! Stove expert replied: Pleased to hear your are happy with the stove and the quality, design and operation are what is said on the literature. Now enjoy and relax! Stove expert replied: Do take note that operating a stove at this temperature is not recommended, short periods of fast burn (20 mins max) is recommended as prolonged periods of high temperatures (that exceed normal usage) will expose internal components to higher temperatures than normal and can lead to distortion or a shortening of their life. The curing of the paint should not require the high temperature burn as stated in this review. 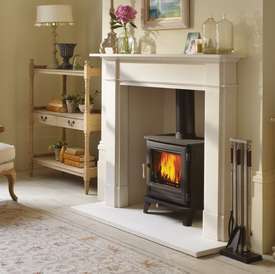 A traditional, 8kW stove from Chesney.